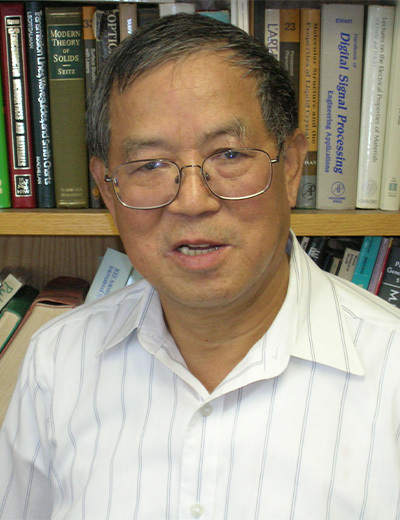 Chi H. Lee is currently a Professor Emeritus of the Department of Electrical and Computer Engineering, University of Maryland, College Park. He received B.S. in Electrical Engineering from the National Taiwan University in 1959. He received the Ph.D degree from Harvard University in Applied Physics in 1968. Dr. Lee is a nationally and internationally known expert on ultrafast phenomena. He is a pioneer in developing the synchronously mode-locked dye lasers. He is also a pioneer on the study of the picosecond photoconductivity effect in semiconductors. He is leading a field of developing ultrafast optoelectronic devices, and in optically controlled millimeter-waves. His fields of specialization include: Picosecond optical electronics, lasers and nonlinear optics, millimeter-wave technology, ultrafast phenomena and microwave photonics. He has published more than 300 papers in these areas. Dr. Lee is the editor of three books: (1) Picosecond Optoelectronic Device, Academic Press (1984), (2) Picosecond Electronics and Optoelectronics, co-editors: Monrou and Bloom, Springer-Verlag (1985), (3) Picosecond Electronics and Optoelectronics II, co-editors: F.J. Leonberger, F.Capasso and H. Morkoc, (1987). He was the chairman of the technical committee on lightwave technology in the IEEE Microwave Theory and Techniques (MTT) Society. He was the program co-chair of the topical meeting on "Picosecond Electronics and Optoelectronics" in 1985 and 1987. He was the general co-chairs of the International Meeting on "Microwave Photonics" in 1998. He served as the chairman of the Steering Committee of the International Microwave Photonics Meeting for 1999. He has been the chairman of the IEEE/LEOS technical committee on Microwave Photonics from 1997-2003. He also served as one of the guest editors of the special issue on Microwave Photonics for the Journal of Lightwave Technology in the December, 2003 issue. He was the general chair of the IEEE/LEOS Summer Topical Meeting on Photonics Time/Frequency Measurements and Controls, July 14-16, 2003 in Vancouver, Canada. Currently he is on the steering committee of the Journal of Lightwave Technology. Dr. Lee is a Fellow of IEEE, the Optical Society of America and the Photonic Society of the Chinese American.